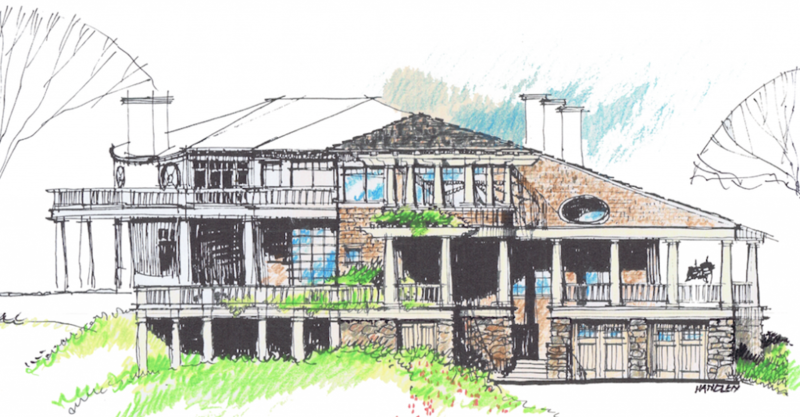 Many architects and designers will tell you that the most enjoyable part of their job is when they’re creating the initial concepts of their designs. While most utilize computers, some still rely on pencils, markers, and paper as they develop their ideas on the proverbial drawing board. The following pages offer glimpses of various concepts and sketches still in the design development stage. While some of these ideas may not continue beyond their colored-pencil studies, others will eventually be developed into construction plans. There’s no doubt that computers and 3-D software programs offer incredible opportunities for design excellence. 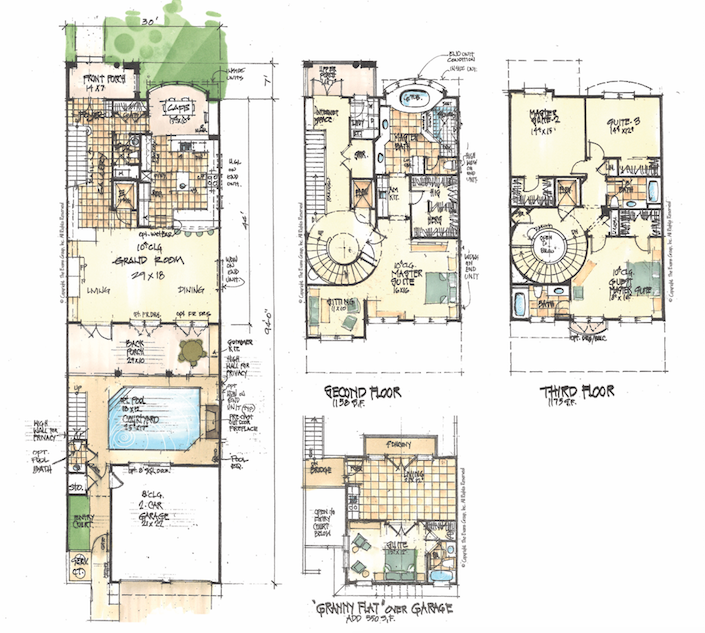 Still, it’s inspiring to see the design process unfold from artful initial renderings created by hand, with just a pen or pencil, paper, and drawing board. 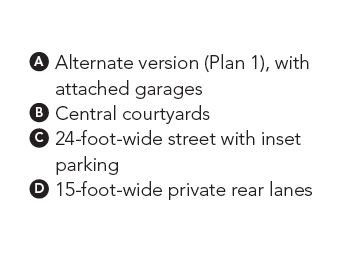 Garage apartments aren’t a new idea; many neighborhoods built in the 1920s and ’30s used rear alleys to access detached garages containing living quarters, often called granny flats. Providing an affordable home for first-time buyers is a challenge, but income from renting out a garage apartment can change the financial picture. 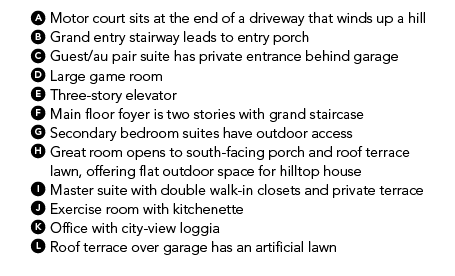 An accessory dwelling unit (ADU) can also be rented to a tenant, or provide a secluded place for guests or a boomerang kid, a home office or studio, or room for a caregiver. 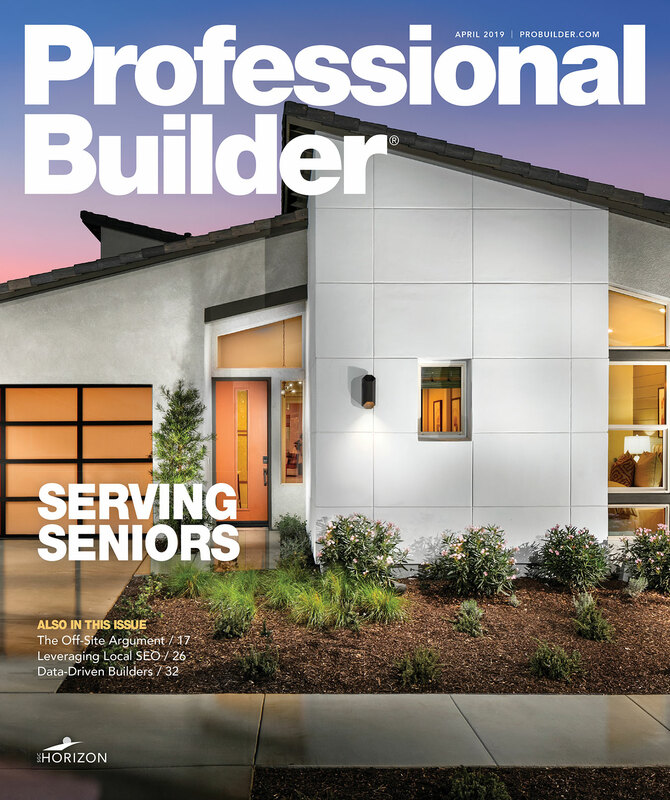 Many jurisdictions restrict or even prohibit these structures, but the growing demand for this type of housing is prompting acceptance. 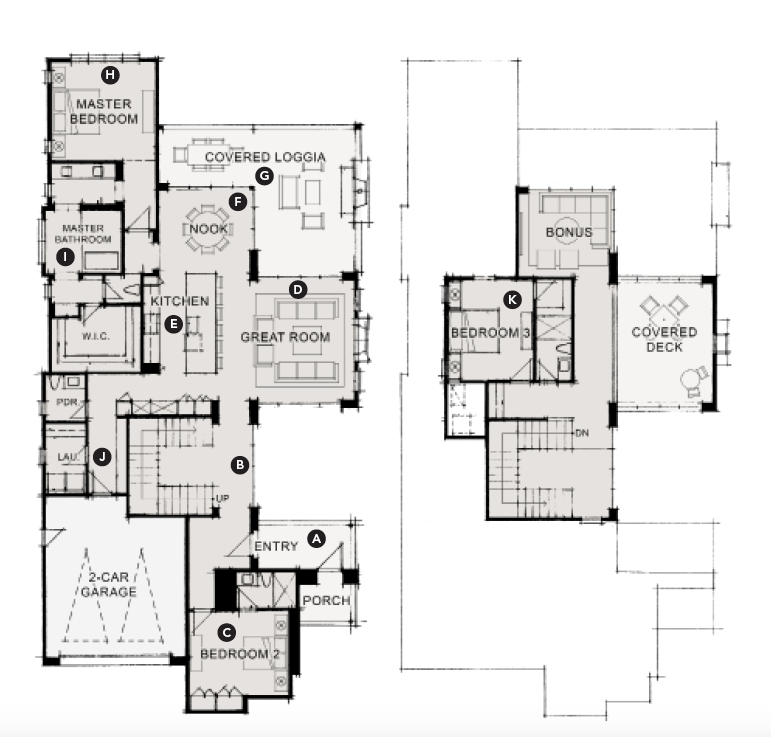 Shown below and at the center of the site plan is a two-bedroom, 2 ½ bath home with a loft. 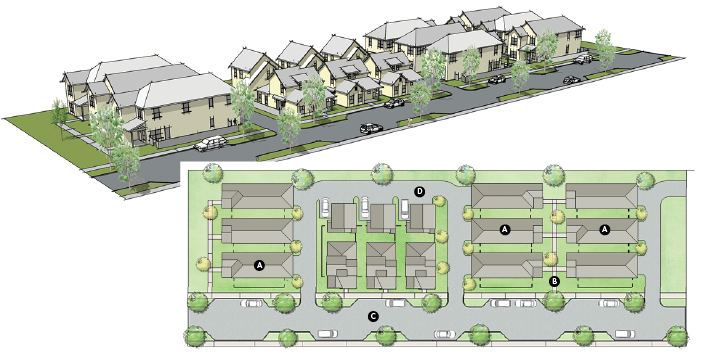 Each house faces a front sidewalk and a narrow street and has a private side yard. 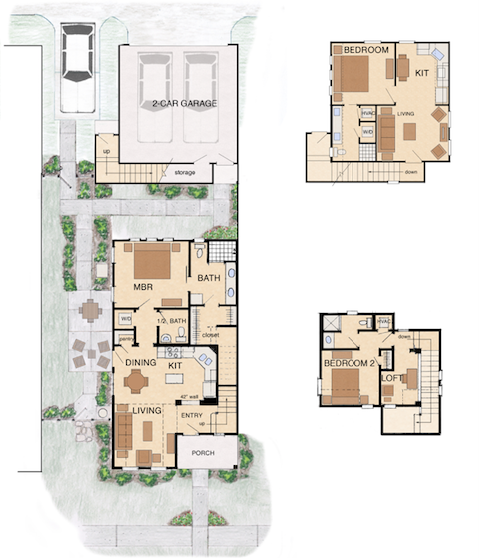 The alternate version (Plan 1), on each end of the site plan, offers a two-to-three-bedroom home with a two-car attached garage. 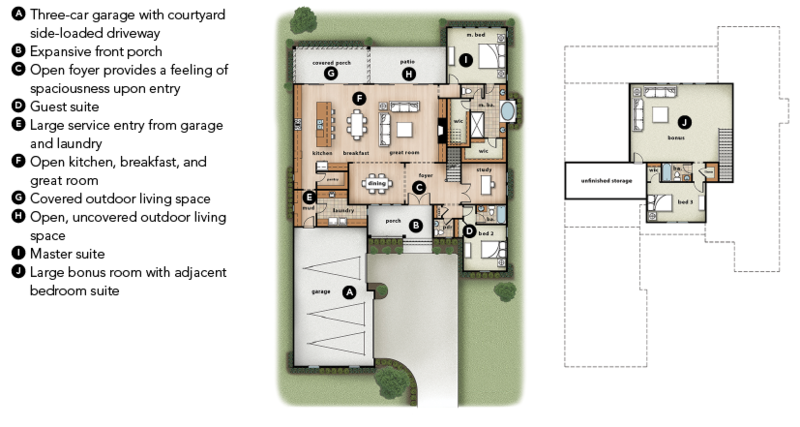 Each home faces a central front courtyard and has a side yard for secluded outdoor living. This luxury home, an attached, three-story courtyard house, has five bedrooms, 4 ½ baths, plus a 550-square-foot granny flat over the garage. Attached living is a lifestyle choice; it means opting to forgo the exterior maintenance of your home. 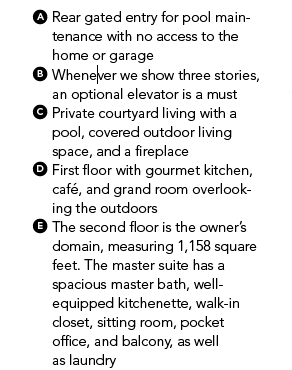 At the same time, buyers don’t want to give up spacious living with a private courtyard pool, two-car garage, and front and back porches. This home omits nothing—except time- and money-consuming exterior maintenance. San Francisco, the Bay, and the mountains. Given the moderate year-round climate, all rooms have easy access to porches or terraces. A roof deck over one of the garages is covered with an artificial lawn to create additional flat yard space. This home is designed to take advantage of views to the rear, with an expansive foyer that provides long views throughout the home. Kitchen, breakfast room, and great room are arranged in a linear fashion to maximize sight lines to the rear of the home. 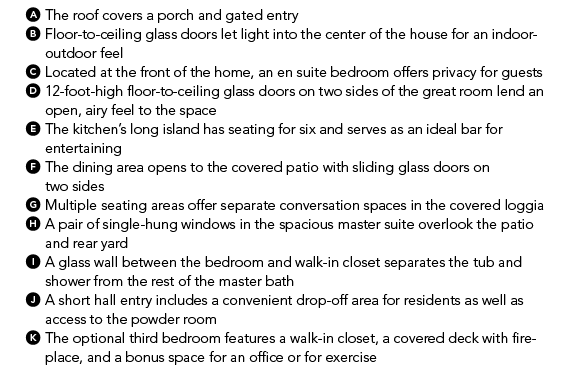 Two 16-foot-wide multi-panel glass doors provide connectivity to the outdoor patio and covered porch. The second-floor bonus room overlooks the rear of the home and offers abundant natural light. Planned for the 8,000-acre private golf course community of Desert Mountain, in north Scottsdale, Ariz., these luxury vacation villas are being designed in a desert contemporary style that recalls the work of Richard Neutra and Palm Springs Modernism. Views of the surrounding Jack Nicklaus golf courses and dramatic scenery of the high Sonoran Desert will be available from the great room, with its 12-foot-high ceiling, as well as the master suite and optional second-floor bonus room and covered deck.